Q. How was your experience of starring in the short film? What is it about? The film was shot for a week in January this year. My dad (Dinkar Rao, fimmaker of Asthi) told me about the concept of this movie – it’s about a girl who is struggling to let go of her mother’s ashes, and I really thought it was a novel idea. The character I portrayed goes by herself to Haridwar and begins looking at things the way her mother would have looked and felt. There’s a sort of silence attached to everything that she’s doing, and in fact in the 15-minute version there’s hardly any dialogues. Because of the theme and silence, you can see the contemplation in her head. The shooting took place in Haridwar – in the marketplace, the ghats, and the river. The weather was really good, the winter was wearing off, it was neither too cold nor too hot, and the river was very clean at this point. I also met an astrologer and I was so fascinated as they seemed to have records of every person who has existed. I got to explore Indian culture on a very grassroot level. Q. Since when have you been interested in theatre? Do you have any plans of pursuing it in the future? I did a play last year of a girl based in Kashmir, who wanted to do MBA but couldn’t because of the curfew situation. In the past, I joined a training course by Barry John. Plus, my dad is a filmmaker, so I know what film acting is like. I’ve done acting in a few films in school as well. I’m generally very interested in arts like philosophy and journalism which require people-oriented skills. Acting and filmmaking is something that I definitely want to pursue. Q. 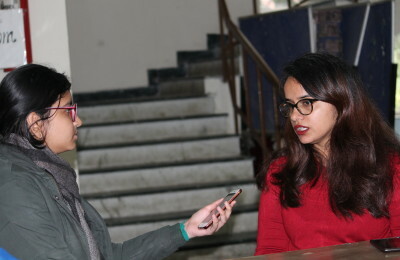 What do you think about the culture of filmmaking in Delhi University? What can be done to improve it? Filmmaking is still a niche concept in DU and enough people don’t do it. The kind of exaggeration that is often present in theatre is not as important in filmmaking, and subtlety plays a major role here. Theatre is important in the sense that there’s an experience we need to have beyond digital media. Since we spend so much time on our phones, theatre is real in a certain sense, but in filmmaking, you can communicate nuances effortlessly. It’s a beautiful art form but sadly there aren’t many platforms for people to explore and offer themselves to filmmaking. Generally, just giving permissions to film screening every week would help a lot. Events should be arranged and encouraged by college authorities and there should be a filmmaking society in each college. As soon as there are more people involved, more competitions come up. A lot more sponsorship can arise from filmmaking as unlike debating filmmaking is more statics – it doesn’t end in an hour and the digital footprint of what you’ve done is always there. Q. Is the environment in JMC supportive of your ambitions and projects? College does tend to be a little strict with attendance but they do give ECAs if you represent a society. Teachers encourage extracurricular activities a lot. The kind of environment in JMC is of a very diverse crowd – everyone has different worldviews, perspectives, and ideologies, and you explore different things through others. I prefer a somewhat academic-oriented environment with seriousness and I like the fact that my college somewhere in the middle. I’m confident that the college authorities will be cooperative in case I plan on going for long breaks of absence for shoots. Q. You’ve grown up with filmmaking since your dad is a filmmaker. How has it shaped you as a person over the years? My dad made this film called Black Widow – it’s about a woman who takes up prostitution after riots. She was gang raped, she had no money, her daughter was killed, and this is one of the very real stories that actually happened. The kind of tolerance about people’s experiences without moral judgment comes a lot from the way my dad makes films himself. It has changed the way I look at life, and more than anything else, helped me appreciate the art of filmmaking and storytelling. I’m not very fond of standard films which have nothing to do with emotions. The kind of art that I value has an actual story rather than being a mindless repetition of people who perform and those who watch it. Q. What do you look forward to in Cannes the most? A film that my dad made and I edited got selected among four other nominations for the India International Film Festival in the Work in Progress lab. There, I saw how people talk to each other, what sort of things are important in filmmaking, and what critics consider when they review films. It really opened me up and I wasn’t so star-struck once I got back from there. Cannes is definitely a huge-scale festival. I’m looking forward to meeting different filmmakers, companies, seeing a variety of good art in every sphere, and learn filmmaking in the coming weeks. I’m also looking forward to the country, the culture, the place, and I’m looking forward to dressing up obviously. Jesus and Mary College to Organize TEDxJMC!